UPDATED: Fri., Oct. 27, 2017, 9:15 p.m. In the bowels of the historic Otis Hotel, Oregon-based card shark Curtis Rystadt found a mystery. In a back room sat an unopened safe bearing the name The Earle Hotel, the name the former single room occupancy lodging house used in the late 1940s. “Maybe on the grand opening, we’ll have a safecracker come in and open the safe and we can all find out together,” Rystadt said. The former mortgage broker and World Series of Poker participant has shifted plans for the building, constructed in 1911. Originally envisioning the five-story brick structure as apartments, Rystadt said he has now partnered with the Hotel Indigo brand to turn the Otis into boutique lodging. Rystadt hopes to open the 112-room hotel next summer. Rystadt bought the building for $1.4 million at the end of June and was recently issued city permits to begin an internal remodel of the structure. Architect Ross Farland is handling the design work. The decision to go back to the Otis’ roots of providing temporary lodging came after Spokane developer Ron Wells announced his intentions to remodel the Ridpath as workforce housing, Rystadt said. He also appreciated the approach the Indigo brand takes to its properties, incorporating the flair of local neighborhoods into the design of their hotels. The Otis remodel will be the chain’s first hotel in Washington. Indigo, part of the InterContinental Hotels Group, opened its first location in Atlanta in 2004 and now has nearly 100 hotels in North America, Europe and Asia, according to the company’s website. A spokeswoman for the hotel chain did not respond to a request for comment Friday. Rystadt said he’s looking for a local restaurateur to take up shop on the hotel’s ground floor, the former home of the Coach House restaurant. The new hotel would be the second former single-room occupancy hotel remodeled on that block to become boutique lodging. Jerry Dicker bought the 36-room Montvale a block east of the Otis in July 2015 and has extensively renovated what is recognized as Spokane’s oldest hotel. Dicker said he welcomed the renovation of the Otis. Rystadt said he didn’t have concerns about the potential glut of hotel space along the block. In addition to the Montvale, Dicker operates two Hotel Ruby locations downtown. Walt Worthy’s Davenport Hotel, remodeled in 2002, is also within walking distance of the Otis. Rystadt estimated adding plumbing and electric, and all the other work inside will cost north of $6 million. The Otis has been vacant since 2007, when an investment group purchased the building and forced dozens of low-income residents and criminal offenders on probation to find new homes. Plans to renovate the building into apartments never materialized due to the economic downturn, and ownership had been snarled in legal battles and bankruptcies until Rystadt bought the building this summer. 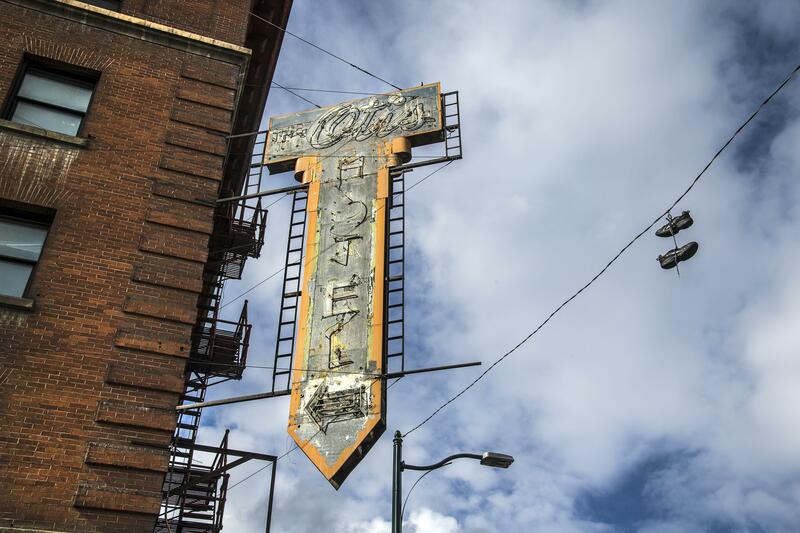 With construction underway inside the old hotel, Rystadt said he’s still pondering what to do with the iconic sign at the corner of First and Madison pointing to the street below. The fire escapes on the outside will stay, but they won’t be functional. Published: Oct. 27, 2017, 4:56 p.m. Updated: Oct. 27, 2017, 9:15 p.m.